so, it's here and it's up and available through Amazon, iTunes, and the Audio Comics Company's own website! 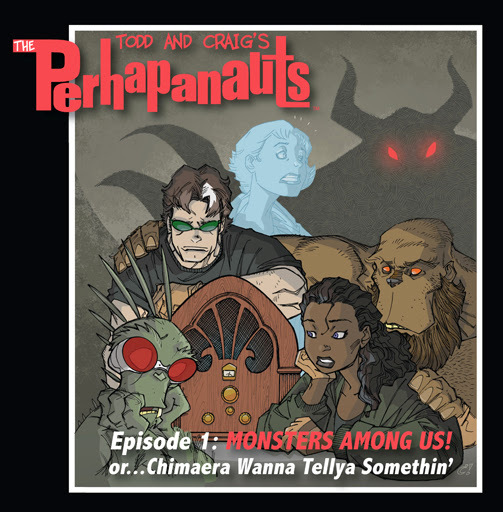 for iTunes, just go to iTunes and type in "Perhapanauts" and you're set! i had a wonderful time doing this, met some absolutely fantastic people, and learned an awful lot about telling a story for radio. if you're dying to hear our Perhapanauts Audio Comic, but don't have a lotta money, race on over to iTunes and get it cheap. if you DO happen to have a little cash in your account and would like to support the wonderful artists and producers who made this thing happen, download it from one of the other sites. either way, i really hope you like it. cd versions of the adventure will be available in early 2014.
continuing our build-up to the launch of our Perhapanauts Audio Comic, we'll fill out the cast with three more members of the family. though CRICKET Sgt Jeff McCluskey hasn't seen a lot of action in the pages of the Perhapanauts, he acts, in this story, as our "eyes in", the character we follow as he is introduced to this strange new world we've dropped him into. so we needed an actor who could be the "everyman", the character that the listener could identify with as the weirdness unfolded around him. brent brought this and more and, right from the start, you can feel him guiding you too through the doors of this mysterious place called BEDLAM. 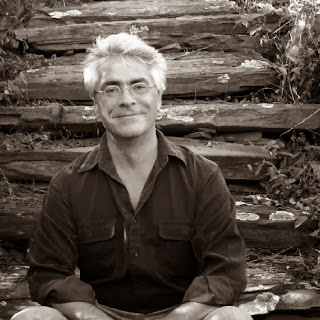 Brent Askari is a member of Mad Horse Theatre and the Stone Pinhead Ensemble. He narrates the nationally syndicated children’s program Animal Science and has performed in numerous audio productions. 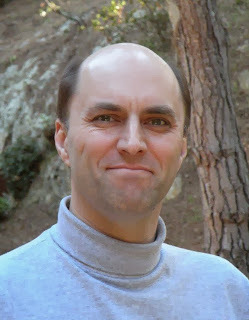 Brent has written screenplays for several production companies, including Paramount Pictures, Marvel Films, and MTV. as the staunch CRICKET Commander Khial Forges, josh had his hands full having to be both authoritative and informative, explaining to mccluskey--along with CRICKET brian mulcahy--the ins and outs of BEDLAM and it's very unique agents. josh did a fantastic job of establishing some semblance of order even when his partner might been pushing his buttons. 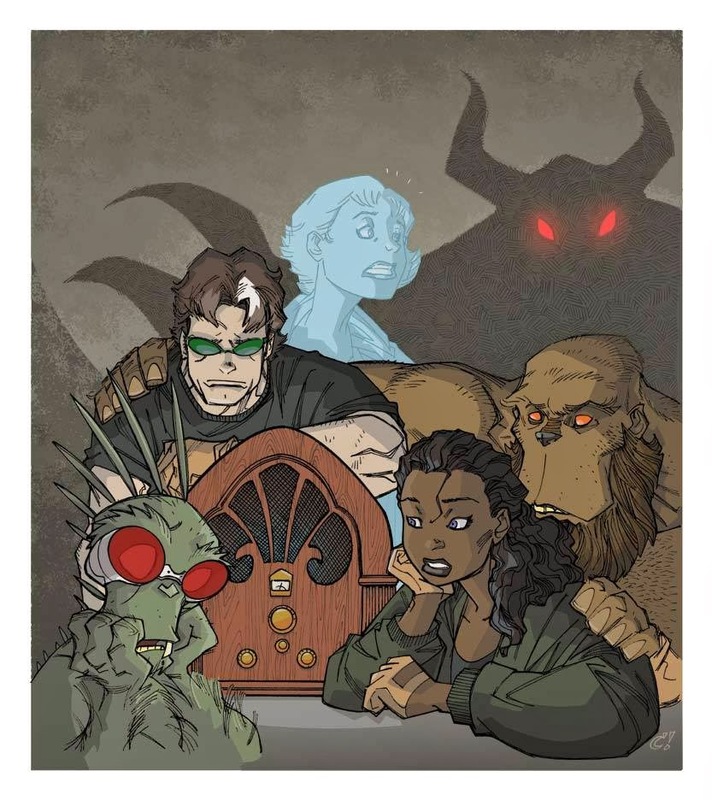 so, with the PERHAPANAUTS AUDIO COMIC set to drop this sunday, december 15th (it's kinda exciting...i've never had anything about to "drop" before...), i thought it would be cool to introduce you the the terrifically talented actors and actresses who brought your favorite paranormal investigations team to life. gathered for a thrilling weekend in portland maine back in july, i got to meet and hang out with elaine, lance, and bill and the dream cast they put together for the first ever perhapanauts recording session. friday night we had a read through and briefing to give some of the actors more insight into the characters than might have appeared on the page. immediately there was a feeling of camaraderie and family--everybody fit together so well. they got to know their characters and we all got to know one another. Robin Miles is an Audiofile Magazine Golden Voice, who they say “never disappoints.” She has recorded over 250 audiobooks, documentary films, museum installations, and audio dramas & comics and is one of the most sought after VO artists in the industry. Fans love her nuanced narration, emotional range, and impressive array of accents and characters, both male & female. In addition to winning numerous awards (Audies, Earphones, and “Best of the Year” designations), she is a Broadway veteran, with numerous classical and new play premiers, TV, film, and museum exhibits from coast to coast. 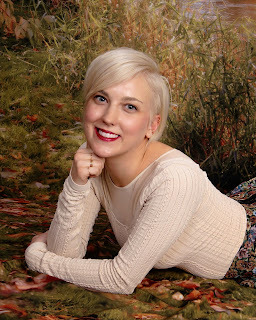 Her recent and notable audio entertainment titles include Paint the Bird, Molly Danger, The Perhapanauts, Cleopatra: A Life, The Warmth of Other Suns, and the 2012 Audie finalist, The Freedom Maze. An accent specialist with a love of language and literature, Ms. 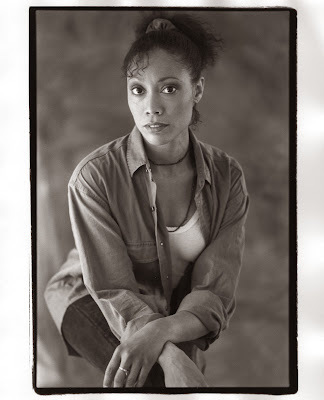 Miles also directs and teaches through her own production and teaching studio in NYC, Voxpertise. She has been Asst. Professor of speech at SUNY Purchase Theater Conservatory, acting teacher for the Neighborhood Playhouse, ESL instructor at Kaplan's NY International Center, and communication coach to Merrill Lynch managers. Now she teaches privately, at the National Audio Theater Festival, and directs celebrities and authors for different publishers. She holds a BA from Yale University, an MFA from the Yale School of Drama and a certificate from the British American Drama Academie in England. i got a chance to hear many of her incredible accents and dialects during an unforgettable 5 hour drive home with her and our molly, actress/comedian jaime andrews. jaime and i looked at each other many times, our mouths agape, as robin wound through her astounding repertoire of voices and accents!! man, did they nail mg.
when bill and lance told me that they'd lined up PAUL DRINAN to voice our mysterious "new guy" on the team--our story takes place shortly after mg joined the ranks of the 'haps--i was eager to see how anyone would handle the very reserved agent without having very much to go on. i had nothing to worry about when i heard paul read him, channeling mg's desire to fit in while still maintaining that air of shadowy mystery. juggling playful and enigmatic is a tough thing--especially using only the tone, timbre, and inflection in your voice--but paul hit it perfectly. after our initial read-through was over, paul was the first to grab me to ask more about his character; what was his deal, back-story, where had he been, where was he going? i sheepishly told him that, sorry, that was all top secret information. he very graciously accepted that, but then i broke and swore him to secrecy. along with craig and scott weinstein, paul drinan is the only other guy who knows the real secret of mg--he's HAVE to know, right? to be able to play him the best. but don't try to break him; we'll find you. 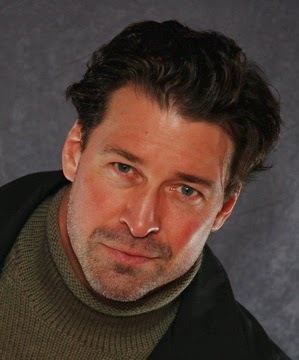 While acting in New York, Paul studied with the highly respected Jodie McClintock (Shakespeare), Terry Schreiber (scene study and stage relationships) and Patsy Rodenberg (vocal coach to the Royal Shakespeare Company). While in LA, Paul had the good fortune of studying voice over with Louise Chamis. 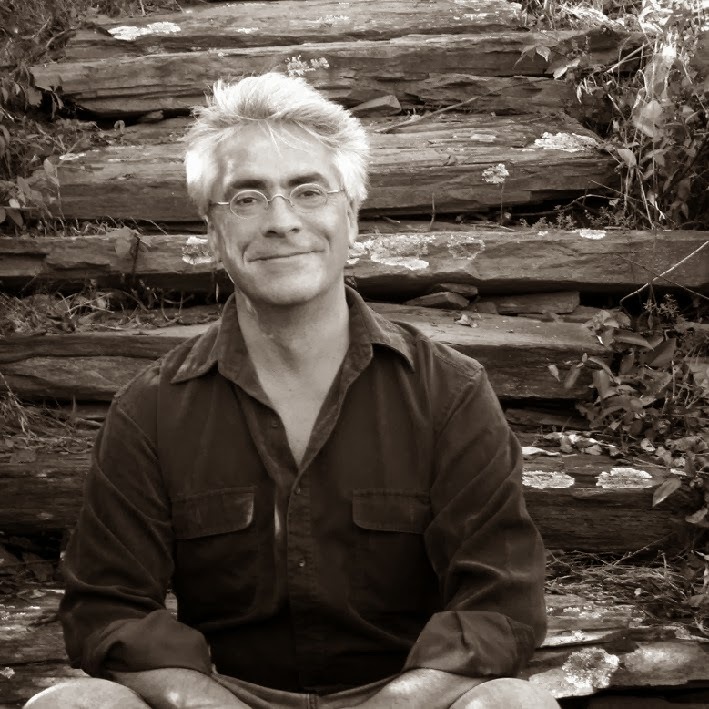 Paul has worked extensively in film, television, on stage and in the recording booth. Directors Paul has worked with include Stanley Tucci, Jim Wilson, Mel Gibson, Joe Pitka, and Bill Dufris. Paul has shared the set and stage with Cameron Diaz and Mark Jacoby, narrated for The Portland Symphony, and has been a personal bartender to Dan Rather. Favorite theatrical roles include Stanley in A Streetcar Named Desire, Berowne in Loves Labours Lost, Nick in Over The River, MacDuff in Macbeth, Michael in What Happened Was, Mitchell in The Little Dog Laughed and Steve in August: Osage County. 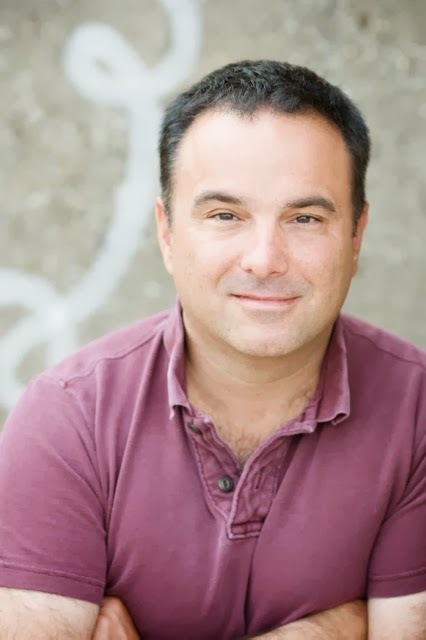 Paul is a founding member of the Acorn Shakespeare Ensemble, the award winning audio theater group Rocky Coast Radio Theater and has performed with members of The Royal Shakespeare Company. more on this awesome cast tomorrow! 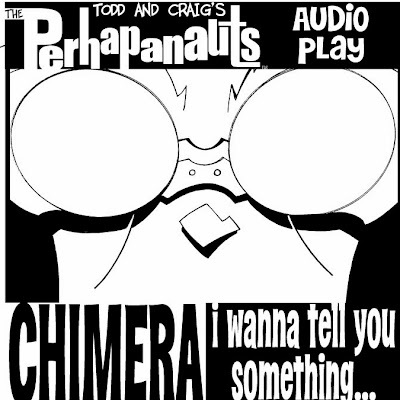 "so, wait a minute, todd," i can hear you saying, "what's the story of the first ever perhapanauts audio comic all about?" well, i'm glad you asked. 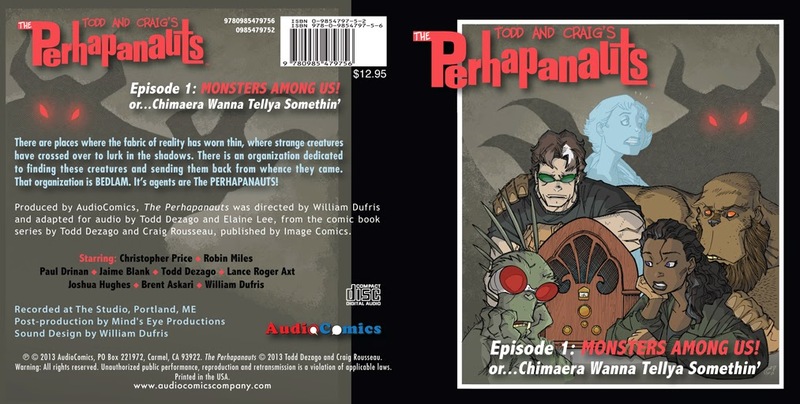 the perhapanauts audio comic--which i continue to refer to as anything from "the perhapanauts audio adventure!" to "the perhapanauts radio drama!" to "the perhapanauts sound movie thingy!" --is loosely based on our very first storyline from First Blood/Dark Days. Entitled "MONSTERS AMONG US!" or "Chimaera Wanna Tell Ya Somethin'...!" it follows the reveal of the strange and mysterious doings at BEDLAM by CRICKET newcomer, sgt. jeff mccluskey. elaine is also responsible for some of the background voices and some off-mic character direction. as i've said, elaine is the writer/co-creator of the ground-breaking stage play and then graphic novel, STARSTRUCK. if you have yet to experience STARSTRUCK in any of it's incarnations, then you're missing out on something wonderful! illustrated by the incomparable Michael Kaluta, the graphic novel is available in bookstores and, of course, through amazon. the Starstruck Audio Comic is available through amazon, iTunes, and audiocomicscompany.com. 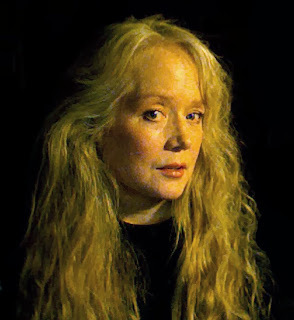 she has also written a number of comics that have appeared in dc, vertigo, heavy metal, epic comics, and eclipse. 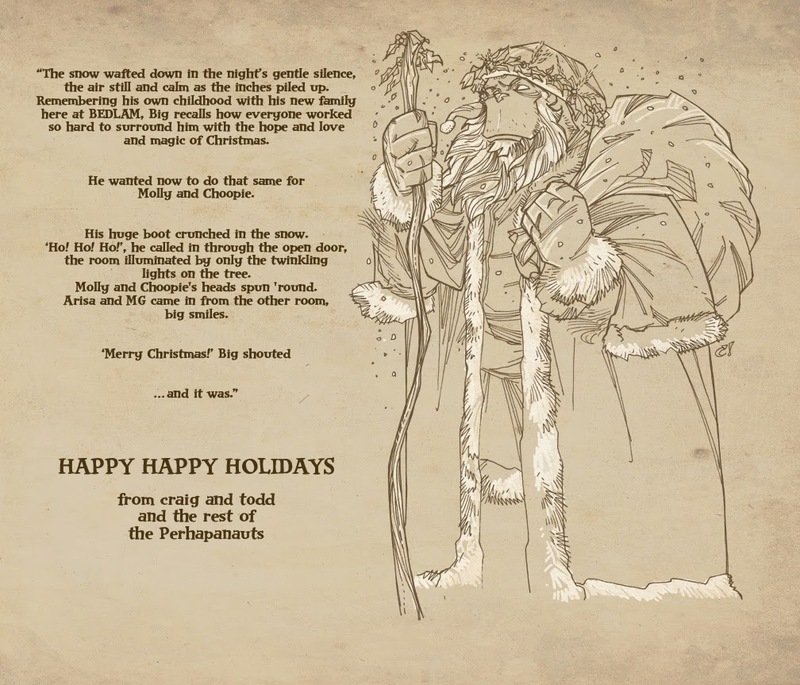 also on the production end of things--although everyone provided voices to the production as well--is lance roger axt, who is the director/co-creator of the audio comics company and the guy who actually wrangled this production, and all the talent that went with it, together. lance kept the ship running through the weekend while simultaneously taking on the task of bringing CRICKET commander brian mulcahy to vocal life...a daunting responsibility in that! Lance Roger Axt (Sergeant Mulcahy) is the co-founder of AudioComics, through which he appeared in the productions of Starstruck, Titanium Rain (Episode One), Honey West: Murder on Mars, Battle for LA, The Domino Lady, and Molly Danger. He also oversees the company's Pulp Adventures line in San Francisco. In addition to AudioComics, Lance has been a proud member (and as of 2010, Vice President) of the National Audio Theatre Festivals, Inc., an organization dedicated to the education and promotion of contemporary audio theatre, since 2002. 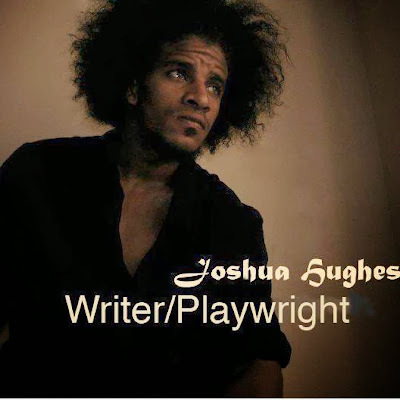 He has been a regular attendee at the NATF’s Audio Theatre Workshop, and directed the world premiere of Knocking on Heaven’s Door, written by comics legend JM DeMatteis, at the 2011 ATW. He also produced the NATF’s “Audio Art of Animation” workshop in Hollywood, and is one of the co-creators of the Norman Corwin Award for Excellence in Audio Theatre, the only award of its kind in America honoring life achievement in audio theatre/radio drama. and where would we be without our energetic, animated, generous director, bill dufris?! bill has a long list of credits which i will leave for his bio (below) to reveal, but needless to say that bill knew the entire story frontwards and backwards and guided the cast through it (seemingly) effortlessly. in that he would also be acting as editor/producer of the production, bill also knew what he might need later in the editing room and, like the master he is, had us give him multiple takes in all the right places. also jumping in to voice karl the moth man, bill brought this thing home! William Dufris is the original voice of BOB (and Farmer Pickles/Mr. Beasley/Mr. Sabatini) in the popular children's show, BOB The Builder - for US and Canada (Series 1-9). William began his audio career in London (radio plays, audiobooks, film/animation dubbing, language tapes, etc), where he resided for 13 years. While there, he had the honor of sharing the microphone in a number of BBC Radio plays with Kathleen Turner, Sharon Gless, Stockard Channing and Helena Bonham-Carter. These experiences led him to co-found three audio production companies - The Story Circle, Ltd, Mind's Eye Productions and Audio Comics Company, for which he produces, directs, acts and engineers . 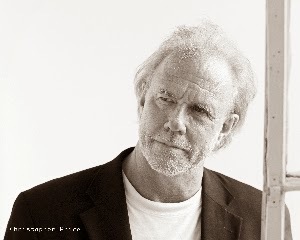 He has been nominated over 10 times as an audiobook finalist for the APA's Audie Awards (winning in 2012 for Non Fiction - The Murder of the Century by Paul Collins), and has garnered 22 Golden Earphones Awards through AudioFile Magazine - as well as being named “One Of The Best Voices At The End Of The Century” (AudioFile Magazine), as well as 2008 and 2009.
more on the cast and the production tomorrow, but that's all for today. so, as some of you may know, a year or so ago i was approached by my good friend, elaine lee---yes, THAT elaine lee who, among many other things, created with michael kaluta that galaxy-spanning, spectacular space-opera, STARSTRUCK--to see if craig and i would be interested in having our little perhapanauts turned into a radio play by her pals at the AUDIOCOMICS Company. we, of course, said yes. i was introduced to elaine's fellow producers at audio comics, lance roger axt (voice artist and owner/director of lra voiceovers) and bill dufris (voice artist/featured audiobook narrator and editor) and, after some fun conversations over what form the production would take, i got to work on a script. jump to this summer, where i and an amazing collection of talented people spent a lovely weekend in portland maine voicing and laying down background noise for the audio comic, hopefully giving bill enough for him to shape it all into a fast and frenetic--and hopefully enjoyable--audio adventure that everyone would want to hear. over the past few months, while juggling an already busy schedule, bill has been able to sculpt what i think is a fantastic experience that your ears will not want to miss! 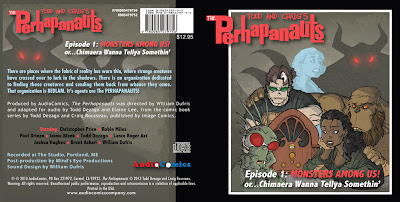 The Perhapanauts Audio Comic: "MONSTERS AMONG US!" 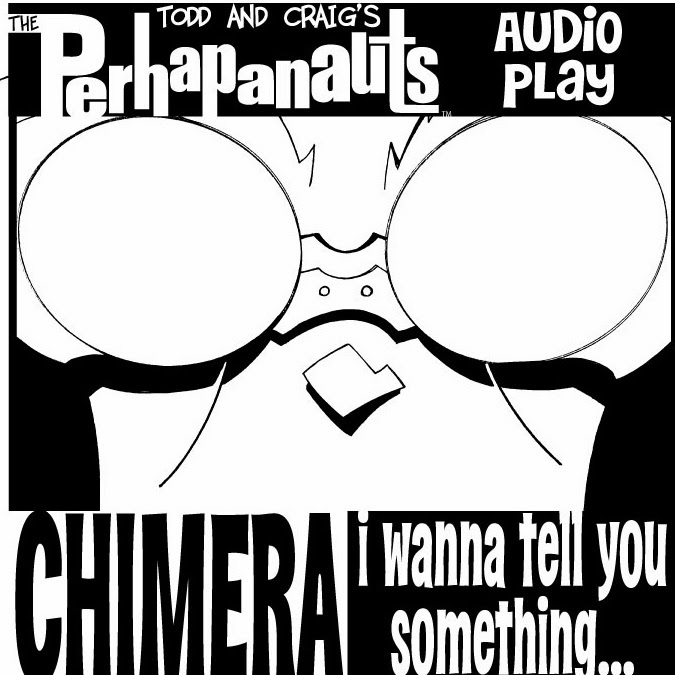 or "Chimaera Wanna Tell Ya Something"
makes it's official debut this Sunday, December 15th on iTunes, Amazon, and, of course, on the AudioComics website! for the rest of this week i'll be posting some pictures and bios of the very talented actors from the cast, giving you the 411 on who played whom and alla that. here is craig's artwork for the production, which will appear on the cd and download.